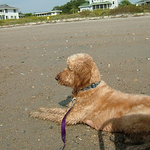 We spent October 12 - 19 at Edisto Beach with Marilyn and her new dog, Abby. Janet and J.R. couldn't make it--we missed them. Our camera broke, so these are Marilyn's pictures.